Racially motivated murders of Black people is a legacy that’s been passed down for decades in this country. And while there were no hashtags for Jesse Washington (a 17-year-old Black farmhand lynched by a mob of 10,000 white people in Texas in 1916), Anthony Crawford (a Black landowner lynched the same year in South Carolina), Ell Persons (a Black woodcutter burned alive and then dismembered by a mob of 5,000 in Memphis in 1917), the 100+ victims of the East St. Louis Massacre, or the scores of others, word in the community still spread and plans began for the first mass protest for Black lives. The “Silent Protest Parade” went down exactly 100 years ago today — July 28, 1917 — and is being commemorated by today’s Google Doodle. The idea of James Weldon Johnson, the author of the “Black National Anthem,” the parade ignited a strategy that would later influence the Civil Rights Movement and the Black Lives Matter movement. It was a Saturday back in 1917 when, at 1 p.m., between 8,000 and 10,000 African Americans silently filed down Manhattan’s Fifth Avenue toward Madison Square. 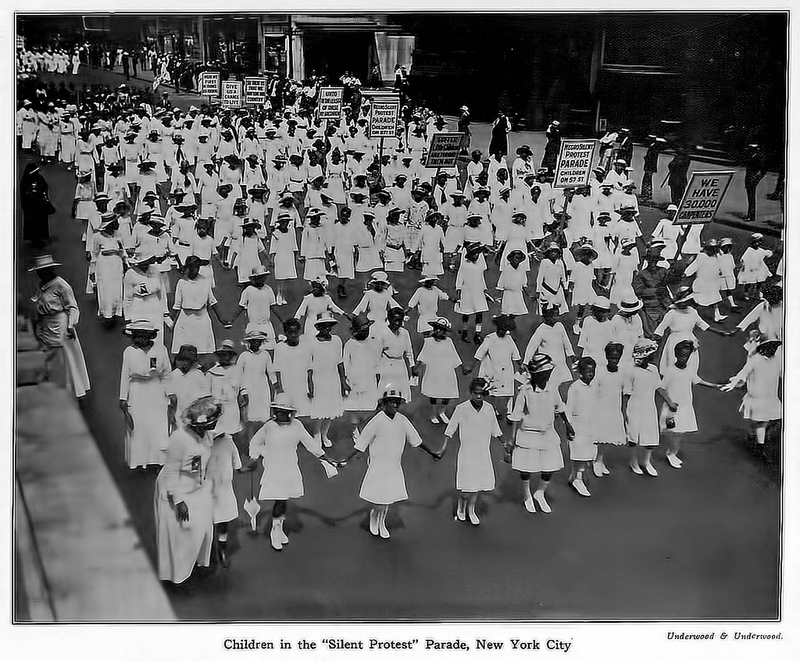 The women and children were decked out in white and led the parade, while the men brought up the rear, per the order of the march instructions described in the NAACP’s protest flyer. They marched “because by the Grace of God and the force of truth, the dangerous, hampering, walls of prejudice and inhuman injustice must fall.” They marched “because [they were] thoroughly opposed to Jim Crow … Segregation, Discrimination, Disenfranchisement, LYNCHING …” They marched for a better future. Be that better future by honoring them and continuing the fight for true freedom.